My apologies for posting this block so late. I have had the block prepped for a couple of weeks, but wanted to make sure everything was stitched in place before I posted it. This block comes at a good time. It is a promise that spring is on the way. Honestly! So, here is Butterflies and Lilacs. Then I added the butterfly. Next, I added the 2 shades of purple for the lilacs, but notice that only the outside edges are turned under and the edges that meet in the middle are left raw. That is because all of these little lilac petals will cover the raw edges. This block (along with the previous blocks) are available on my website Simple Bird Studio. In one of my recent posts, I mentioned my newest obsession….Inklingo. Many readers commented or emailed me and said that they would love to try Inklingo, but just cannot get their head around the concept. Some readers said they have already created an account, but even downloading the Free Shape Collection seemed very overwhelming. That made me sad, because I, too, was overwhelmed when I first went on the Inklingo website. I spent 3 days browsing the site, watching the videos, checking out the shapes, and all the different sizes of each shape. Each time I went on the website, I was getting more and more curious. I was very intrigued with the concept, handpiecing verses EPP, not having to use paper templates anymore, even using Inklingo to stitch shapes on the sewing machine. My head was spinning with ideas, but I was more than a little overwhelmed with all of the information. I honestly didn’t know where to begin. I decided that the only way I was going to learn about Inklingo was to just start printing. So I made a pot of tea and spent a couple of hours with my printer, some fabric and some freezer paper (and an open mind) to see if I could figure this Inklingo thing out. I am so glad I did…so glad…so glad! The best part is…all of that information on the website and the videos started to make so much sense after I printed my very first set of shapes. I would love to share my experience with you in the hopes that you will just give it a try. You will be glad you did! If you have any question at all, Linda is the one to ask. Simply email her and she will get right back to you. First, you will need to set up an account. If you haven’t set up an account yet, check out this link and just follow the easy steps. OK, so now we are going to go straight to Page 70, and you will see that Linda has designed a combination (Combo 2) of all the shapes. That is the combo I used to make these stars. Take the time to print a few of these samples on the fabrics you are using and use them as a reference, just to see how the inks work with different colours of fabric. Once you have tested your fabric, go to the corresponding page and print the combo. Cut yourself 2 sheets of freezer paper 6 3/4″ x 9 3/4″. Press each one to the right side of 2 different fabrics, preferably a light and a dark. It is much easier to cut around the freezer paper, instead of cutting the fabric the same size as the freezer paper and trying to line them up…trust me! Place the fabric/freezer paper (freezer paper side up) into the printer and click on the Print icon. Make sure you click on “current page” and “portrait”. This is extremely important! Ta-da! You are a superstar! Now, do it again with the other piece of fabric/freezer paper. Too easy! If you are wondering how to stitch this eight pointed star together, here is a great video, showing a Kaleidoscope Star, but it is the same idea! P.S…..make sure you watch Part 2. I have an HP printer and (as far as I know) I cannot print Custom Sizes. That has not stopped me from printing my shapes. Once I became familiar with printing the free pattern, I thought I might as well jump in and buy the 1″ hexagon shape (and the 2″ hexagon and the 2″star point!). Just like the free diamond shape, all of these shapes come with numerous layouts and each layout can be printed with all 20 colours of ink. So there are lots (and lots!) of pages to scroll through. If you click on Page 13…. …you will see different sizes of freezer paper with the number of hexies that you will get out of each sheet. Make a couple of paper copies of this page. You will want to refer to them from time to time. I started off with just printing a 7.25″ x 11″ page just for the fun of it. What did I have to lose? Nothing!! Then I thought that maybe I did not want 12 hexies from the same fabric and maybe I wanted a scrappier look. Then I started cutting 5.75 x 7.5 pieces of freezer paper and lo and behold…..I ended up with just 6 hexies! Everything was starting to make sense! One of my many “aha moments” came when I thought…”I wonder if I can print on a 5″ square”. So, I fed a 5″ x 5″ piece of fabric/freezer paper into the printer and this is what came out. I used the same layout as the fabric above. …I wondered who in their right mind would want to cut all those hexies apart with scissors. But if you had 5″ piece of fabric and wanted to get as many hexies out of it that you could, cutting them apart with scissors is an excellent idea! Now I am on a roll!! That is when I started to realize that the more I played around with Inklingo, the more I was learning and the more excited I was getting. Here is another very useful bit of information. You may be wondering what the difference between “Portrait” and “Landscape” is, so I did sample of each. Both are the same layout and I cut both pieces of fabric/freezer paper 8 1/4″ x 12″. Can you see the difference? The one on the right is printed “Landscape” and gives us 15 hexies and no waste at all. The one of the left is printed “Portrait” and only gives us only 12 hexies with lots of wasted fabric. See? It is really all very useful information! Hopefully, I have convinced you to give Inklingo a try. It is actually very simple to use, once you spend a bit of time just printing for the fun of it! This is what I am currently working on using the 1″ hexies. I am hand-piecing them, which is done with a simple running stitch, very much the same as the handquilting stitch. This video sums it all up! And here is the back! Once I started printing and stitching, I couldn’t stop! Today I am on a mission….I am going to finish this last corner block of Sue Garman’s “Friends of Baltimore”. After that I will sew the remaining half-square triangles that will be stitched to the edge of the border. I told my family that I am having a “me day” and if they need me, I’ll be in my sewing room…with the door shut! I am linking up to Slow Stitching Sunday, so go on over and check it all out!! 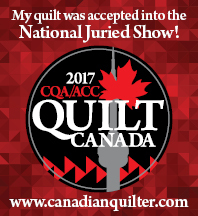 Yesterday I stopped at a delightful quilt shop in Shelburne, Ontario called “Cobwebs and Caviar”. I spotted this spectacular fabric and just had to have some. I have no immediate plans for it, I just had to have some! It is by French General. And, my hexies are coming along quite nicely. 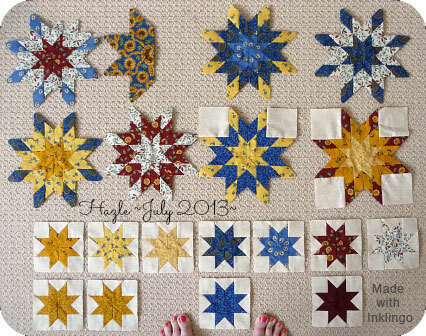 Edyta Sitar has a new book called “Handfuls of Scraps” and I am using her quilt on the cover as a bit of a road map.